Hilary the Bride: Our wedding was long awaited as we are both too horizontal for our own good. After a perfect proposal followed by welcoming our son Luca to the world, a celebration of us as a couple was the next thing on our list. 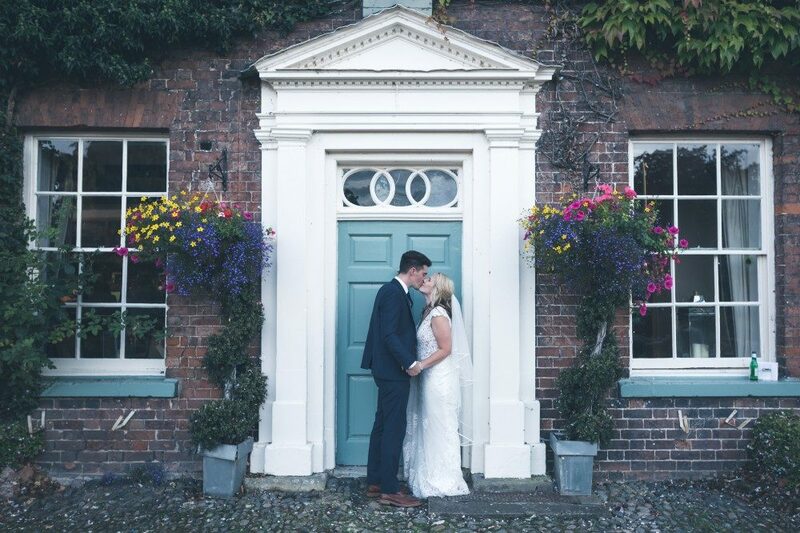 Having both grown up in the area, Shropshire was only ever going to be home for our wedding. 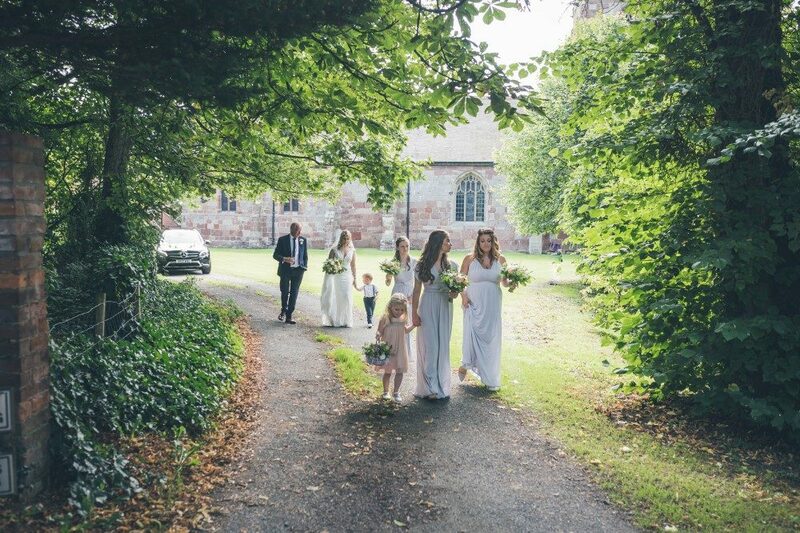 The Mytton and Mermaid ticked all the boxes for our relaxed wedding which was so far outside of the usual package. 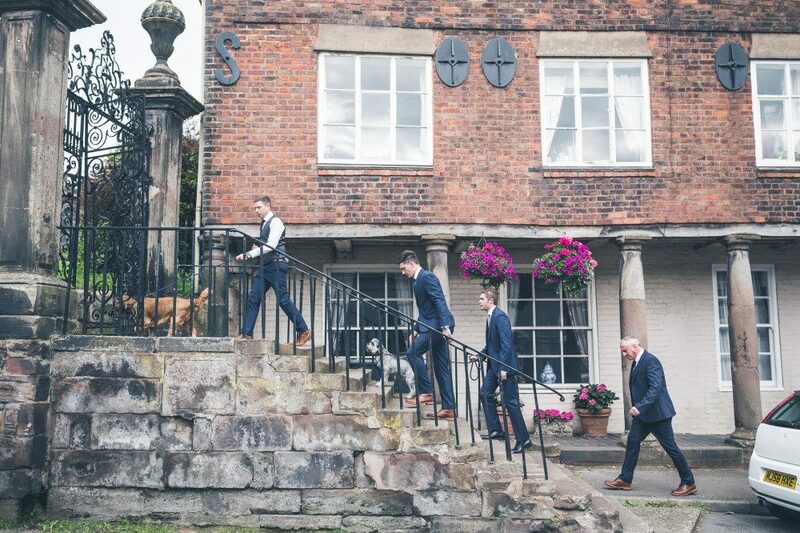 Set alongside the beautiful banks of the river Severn it was the perfect location for our indoor/outdoor summer wedding. The setting has dozens of wild flowers, over-hanging trees and beautiful bridges giving our guests a naturally romantic back drop. 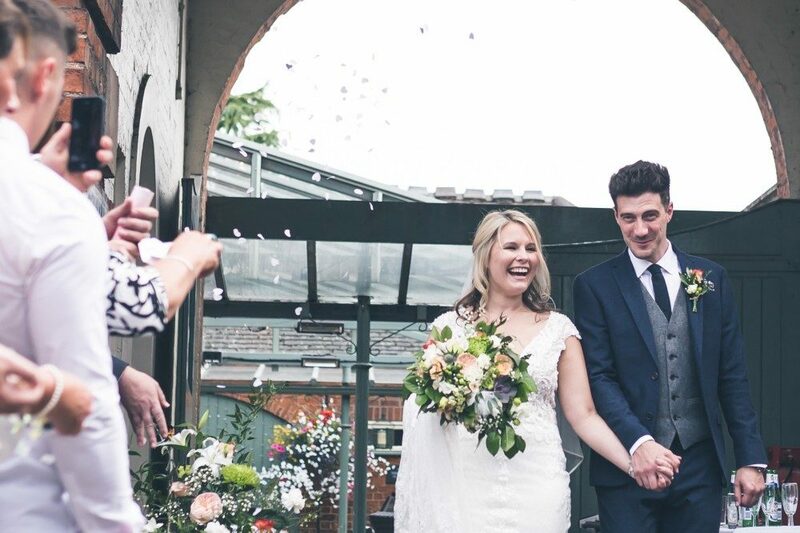 We were free to utilise the old stable to get married in, courtyard for drinks, a beautifully intimate dining room, riverside for even more drinks all on what turned out to be one of the most beautiful days of the year. 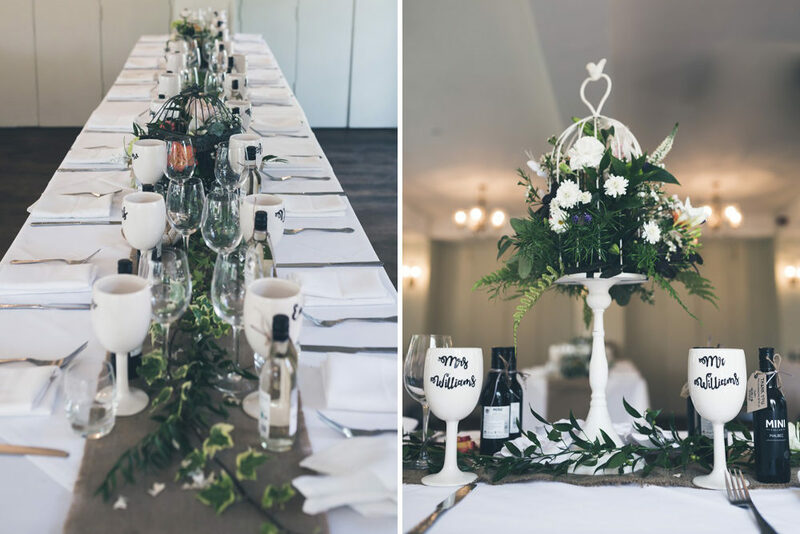 Rather than a strict colour scheme we were keen to keep everything soft, rustic and floral. Neither of us are super polished people and preferred a palette of soft greys & apricots coupled with lots of green foliage and hessian. It meant our decoration could be dominated by beautiful floral displays, paper roses, ivy, bunting, fairy lights, hessian runners across huge long tables and stunningly filled bird cages. I had an idea of a wedding dress and true to form my dress choice was so incredibly me yet not without that delightful twist of WOW I recommend for every bride. My Signature Collection dress was a bohemian style with delicate pearls, soft lace with a long train and, surprisingly for me, a sheer back. I was delighted with the flattering fit that made me feel beautiful whilst still super comfortable ready for the big party we had planned! My friends weren’t short of a few cross country wedding dress trips, particularly one, and I’ll be eternally grateful Nicci! I wasn’t going to wear a veil but after trying on a beautifully tiered one I was hooked and went on to wear it nearly all day – I highly recommend giving one a whirl. I had a Monica Vinander necklace all laid out ready to impress but nothing could outshine the simple silver necklace adorned with mine, my husband to be and our three year old sons initials. It was a gift from the man himself the night before that blew any designer out the water. My fabulous friend Jenny was my hairdresser and my lovely make up artist was Kassi Ellis who both interpreted our wedding style perfectly keeping everything classic and natural whilst bringing the best morning of wedding banter I could ever have wished for! Michael has a distinct ability to pull off any slim fit suit but his Limehaus Donegal suit was the best I’d ever seen him in. Keeping along the classic navy style the boys all rocked variations of the same suit leaving mikes to stand out just the right amount. 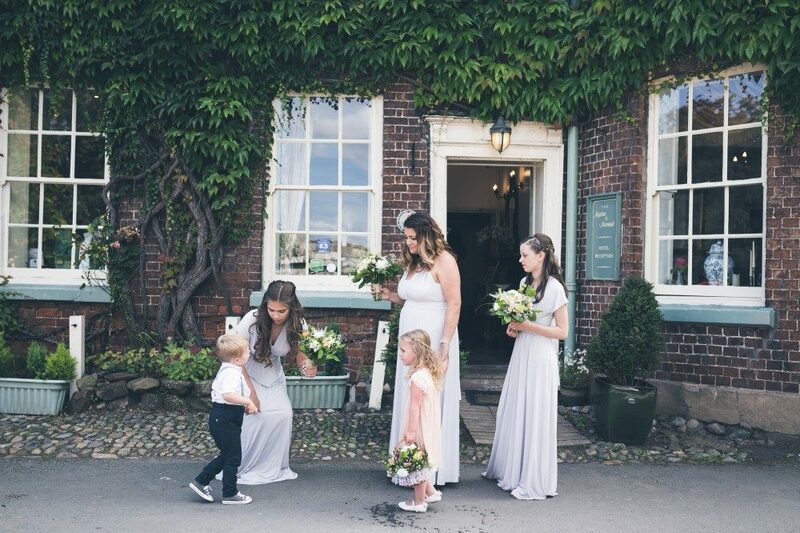 Our gorgeous bridesmaids wore dove grey maxi length dresses sassing different styles to demonstrate their own personalities. My little one, Luca, in a shirt and braces with grey Converse, stood alongside his best friend Bella in an apricot dress and both stole the opening show – memories caught in photos we will never forget, literally not a dry eye in the house. I don’t think I’ve ever seen so many tears of joy as I did at our wedding (including a lot of my own!) and I think our tailored ceremony played a big part in making it as personal as possible. We love the personal touches that shone through the day. Me and my friend own ‘Doodle Alley’, a paint your own pottery studio and it was only right our favours were beautiful hand painted goblets for all our fabulous guests to remember the day by. Family and friends play such a big part in our lives and my mum is the most talented human I know. Casually turning her hand to floristry she took the somewhat overwhelming dream of mine for a floral wedding and was responsible for the most beautiful work I’ve ever seen. 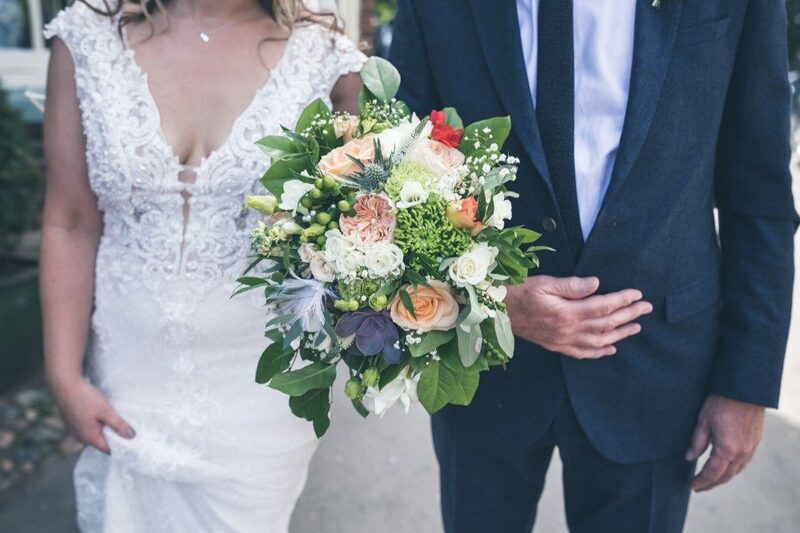 My bouquet was stunning full of greys, apricots and greenery in amongst subtle feathers and pearls. My Pinterest boards were brought to life and the smell alone of hundreds of table decorations, corsages, bouquets and displays helped bring our country wedding alive. Introducing me to flowers and succulents I’d never even heard of she really was the star of our show and would rival any professional out there. Our special friends gave us the beautiful gift of The Wedding Pianist Ben Clarke throughout the daytime which allowed Michael’s awesome music choice and my not so awesome music choice to be played in a suitably classy way. Michael and I love a party, not to mention our guests. The evening band was a hard choice but the Electric Soul Club put on an incredible show and everyone danced to the bitter end. We wanted to make sure our day was as much of us as we could squeeze in to every corner which meant plenty of food and drink! From me and my friend hand making hundreds of chocolate truffles, to a huge lunchtime bbq we made sure our friends were well fed. A party isn’t a party without a buffet and our cheese tower saw off any midnight snackers! One of my favourite friends Emma created a gobsmacking brownie tower which more than satisfied any sweet tooth. 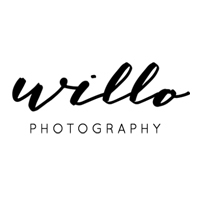 My sister in law recommended Willo Photography. The hours of searching for the story telling I was after suddenly became irrelevant because his work made it the easiest decision of all. Just chatting with Lee I knew he was perfect and on the day to be joined by a second shooter who was his wife, Karen, made a somewhat shy couple feel so comfortable. 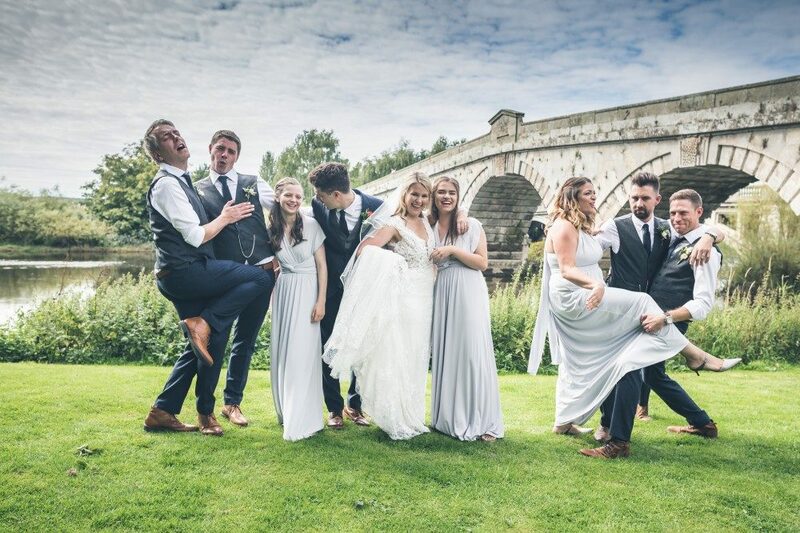 They became our friends and a pair we could have fun with whilst knowing they were capturing our day, family and friends in exactly the way we hoped. The story they told allow us to relive our day whenever we want in the most heart warming way. Our three year old says it was the best wedding ever and quite frankly we agree! You have captured the emotions of this wedding perfectly. I love the location.